Green Enchiladas with Pork – Prepare Them! This Mexican dish is very popular because it admits many variations in its preparation. For these enchiladas we have many contrasts , where many ingredients of very distinct flavors unite in a same dish. First is the pork meat that is wrapped in corn tortillas. Then the corn tortillas are covered in a green salsa and as a final touch the enchiladas are garnished with cream, onion, cheese and more ingredients – that make of this dish a parade of Mexican flavors . 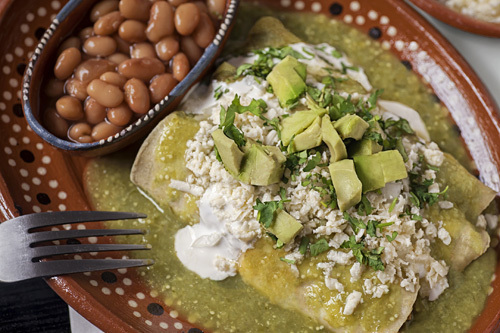 The enchiladas are served as main course and normally they are so abundant, that they are served alone on the plate. Although if you want to accompany them you can put white rice or refried beans. Get ready to work a lot because many steps have to be followed to make these enchiladas. The enchiladas are really not difficult to prepare but experience in the kitchen is required. Use pork loin in this recipe because it is easy to shred although pork leg could also be used. In this recipe the tortillas are fried and vegetable oil has to be used because it resists high temperatures. The enchiladas can be prepared with corn tortillas prepared by yourself. The preparation time is of 1 hour 15 minutes but you will not be working in the recipe all the time. We give the recipe for 10 enchiladas. 1.1 lbs of Pork Loin. Transfer from the saucepan to a blender, with a kitchen spoon, the tomatillos and the serrano peppers that were cooked. 1/4 of an Onion (1.3 oz). When the salsa boils reduce to medium heat and cook it for about 4 minutes, until it thickens a little; stir occasionally. Then set aside. Take 1 maize tortilla with some tongs, dip it in the frying pan oil and fry it for about 7 seconds per each side, until it is lightly fried. Transfer from the frying pan to some paper towels, with the tongs, the tortilla that was fried so it dries and the fat excess is absorbed; then reserve. Repeat the same procedure with 9 more tortillas, it won’t be necessary to add more vegetable oil in the frying pan. All this procedure is done so the tortillas have more flavor. Take from the saucepan the pork loin with the kitchen spoon, wait until it cools a little and shred it; then set aside. Don’t throw away the broth that was obtained from cooking the pork because it is very tasty and you can use it to prepare a soup. Finely chop 1/4 of an onion (1.3 oz) and 2 coriander sprigs; then reserve. Cut 1 avocado into strips, then reserve. Heat over medium heat the green salsa that was cooked for about 2 minutes, until it is very hot. Take with the tongs one of the fried tortillas (that was put on the paper towels) and dip it in the green salsa that was heated. Put on a large plate the fried tortilla with salsa and put over the tortilla some of the pork loin that was shredded. Roll the tortilla as taco or fold it as quesadilla; then set aside. Repeat the same procedure with the other 9 fried tortillas. Upon completion if there is green salsa remaining pour it over the enchiladas. 1/4 cup of crumbled Fresh Cheese. Sprinkle the Coriander that was minced. Preferably put the ingredients in the same order as given so the enchiladas come out perfect. Tip: If you like the idea you can also put lettuce strips over the enchiladas. Variations: The enchiladas can also be prepared with beef or chicken. Did you like the Enchiladas? ✎ Before eating the enchiladas you can enjoy an appetizer, a soup or a salad. ✎ In this meal you will need a Mexican drink. ✎ As a final touch a Mexican dessert. Prepare the enchiladas with this smoky pork loin. It has a different flavor but it is very special and goes excellent with the enchiladas. Use “La Banderita Corn Tortillas" to make your enchiladas because they have very good flavor, they are soft and they don’t break at the moment of folding. Sometimes is difficult to get the bay leaves. If you don’t find them you can buy them here and the best is that they are organic.